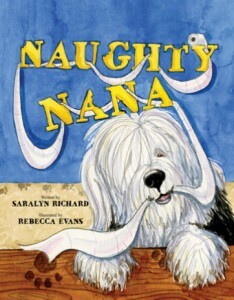 This entry was posted in Family, Fun, Grandmas & Grandpas, Kids, Moms & Dads, Reviews and tagged children's book, Naughty Nana, pets and kids, Saralyn Richard by llpitlwp. Bookmark the permalink. Naughty Nana is such a fun and wonderful book! I hope everyone enjoys it as my as my family does.